Lucainena de las Torres, Almeria, Andalucia, Spain. 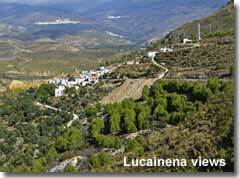 The mountainside village of Lucainena lies at approximately 550m above sea level, situated just outside the perimeter of the Sierra Alhamilla natural park in a little world all of its own. 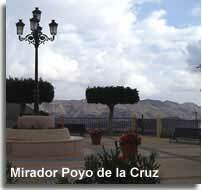 The village is located along the AL-102 and can be approached from either the main AP-7 motorway, or the N-340a Sorbas to Tabernas road. While the first option offers the most rewarding views, since it takes a winding route up the side of the mountains, a head for heights is certainly necessary, access from the Sorbas to Tabernas bypass provides a scenic yet much less dramatic way to reach the village. A quaint village that fulfils the traditional Andalucian image, narrow streets and whitewashed houses decorated with pots of colourful flowers. Dwarfed by its mountain setting the pretty church building stands out as a central focus point, on closer investigations the 18th century church, Iglesia Parroquial Nuestra Senora de Montesion, can be found facing the Mirador Poyo de la Cruz, a picturesque plaza and observation platform offering panoramic vistas over the surrounding countryside. The community square, utilised for village fiestas and the small Saturday morning fruit and vegetable market is home to the town hall, its ageing tree of distinction and the village fuente. The old communal laundry is situated on the outskirts of the village, it is included in the local walking trail which takes a journey through the village, the countryside and the history of Lucainena. A more modern addition to the pueblo is the outdoor swimming pool and sports area. A map of the village layout is located on arrival at the pueblo, coming from the direction of the N-340a, a second map can be found in the main plaza. 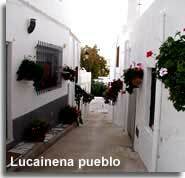 There is an expatriate community in Lucainena, a select few having made this truly rural pueblo their home. With a selection of shops, bars and restaurants, and with fresh produce brought in, all the essentials are covered, and it would be reasonably possible to never have to leave. 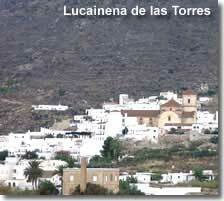 Property in and around Lucainena mainly consists of traditional village houses and countryside cortijos. The ending of the village name is significant in its meaning, de las Torres translates as of the towers, and is said to be derived from its Moorish past, when, in days of old, the village was protected by a wall and seven defence towers, with the main tower providing refuge for the village inhabitants in times of enemy attack. The evident and more recent history of the village is from its modern mining period when iron was extracted from the hillsides. 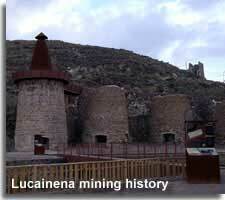 The mining began in 1895 and it was not long before Lucainena became one of the most productive areas in the Alhamilla with one of the best infrastructures in the whole of Almeria province. 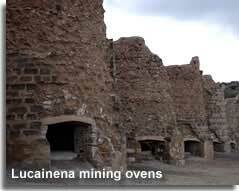 Modern techniques were used for the mining process, after digging out the earth large purposely built kilns were utilised to burn off excess from the iron rich rocks. Due to the areas secluded location an organised transport system was put in place which included the construction of a thirty five kilometre long railway line down to the coast. The industry functioned until its closure in 1942, and today reminders of the extraction and deployment process are still apparent in the Lucainena countryside, in particular, the recently renovated kilns, are now a site of special historical interest. 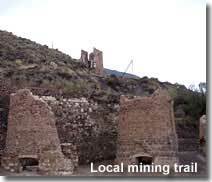 The Senda de la Minera local walking trail includes the restored calcination ovens along with part of the abandoned railway line, a section of which has now been transformed into a walking and cycling pathway. The ovens can also be reach by vehicle, by taking the ALP-721 to Turrillas village from the right turning just before entry to Lucainena village, again if arriving from the direction of the N-340a. Information boards are in place at the site which explain the mining processes used and are detailed in English as well as Spanish. 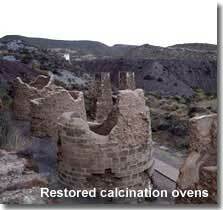 The eight round kilns, constructed in 1900, would transform the rock into a much richer material, each oven was capable of producing fifty tonnes of ore per day. The kilns would be filled from the top with alternate layers of rock and charcoal, special waggons, which opened from their sides, were used for this task after the mined rocks had been sorted and selected by hand. After cooking, the nuggets were removed from the mouth of the ovens and loaded for their onward journey by train. The railway itself, which was started in 1894, ran from Lucainena to Agua Amarga on the Mediterranean coast, from where the ore was shipped, between 1896 and 1931 well over three and a half million tonnes were transported by just nine steam engines. To best experience the history, culture and pueblo attractions, including the stunning mountain scenery, I do recommend the local walking route, SLA -62, it is well signposted by following the green and white markers. And after working up an appetite why not sample some of the local cuisine from one of the village tapas bars. Furthermore, when it is time to leave the village, I have to recommend the mountain route, yes it is a bit scary but the views are incredible, and travelling from Lucainena to Nijar, rather than in the opposite direction, makes the best of the scenic vistas down the Nijar valley. 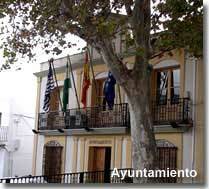 Lucainena, like most Andalucian pueblos, is not without its fiesta celebrations. A few times a year this normally sleepy village comes alive with music, dancing and much merrymaking as its celebrates it traditional holy days. Exact dates and itineraries are available from the town hall. Fiesta de San Sebastian, mid January. Santa Semana, Saturday of the holy Easter weekend. Dia de las Flores, first weekend in May. 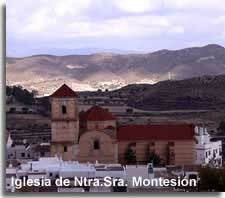 Fiesta de la Virgen del Montesion, third weekend of September. 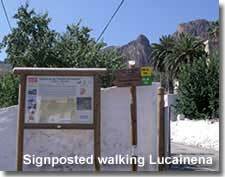 All the signposted walking trails from Lucainena village commence from the same starting point, namely the old railway station which has since been converted into a school. 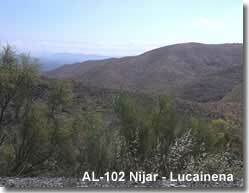 The building, along with the information boards for the different routes, is located from the AL-102 on immediate entry into the village, on the left hand side, if coming from the direction of the N-340a Sorbas to Tabernas road. Below, the name of the route is a link to the Via Verde website which provides a map of the route and further details, in English, and will open in a separate page. The Via Verdes of Spain are old disused railway lines that have been recovered and reconditioned for use by walkers and cyclists, closed to motor vehicles, they offer an environmentally friendly way of enjoying the countryside. 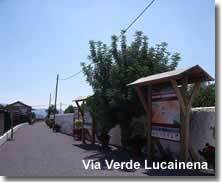 The Via Verde Lucainena pathway utilises a section of the old mining railway, leaving behind the Alhamilla mountains the trail declines towards the Rambla de Lucainena through a landscape of fig trees and fruit trees with almond and olive groves and several old farmhouses, on arrival at El Saltador there is the possibility of continuing the route a further 8km along the Rambla Honda to Polopos. Below the name of each trail is a link to the Mancomunidad de Municipios de los Pueblos del Interior website which provides a map of each route and further details in Spanish, and will open in a separate page. The estimated completion time, distance and difficulty level of each of these trails is sourced and acknowlegded from this website. The circular route traverses both the village and the surrounding countryside, including the old mining area and the restored calcination ovens, it provides an insight into the cultural heritage of the pueblo and incorporates all the notable places of interest. The first part of this trail is along the Via Verde, its direction takes the path of the old mining railway than ran from Lucainena down to the coast. 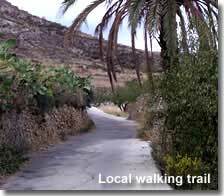 The second part of the trail is via the Rambla Honda and the Rambla de los Morales with an ascent to the area known as Marchales before returning to the village on completion of the circular tour. Part of the much longer GR-244 route, from within Lucainena the immediate trail destinations are Uleila del Campo pueblo in one direction, or the village of Tabernas in a counter direction. This extensive walking trail links many of the villages of the southern Filabres mountain range to those of the northern Sierra Alhamilla foothills in a circular network.